POLYWOOD® remains committed to using the most effective manufacturing techniques, eliminating waste and delivering what our customers expect. 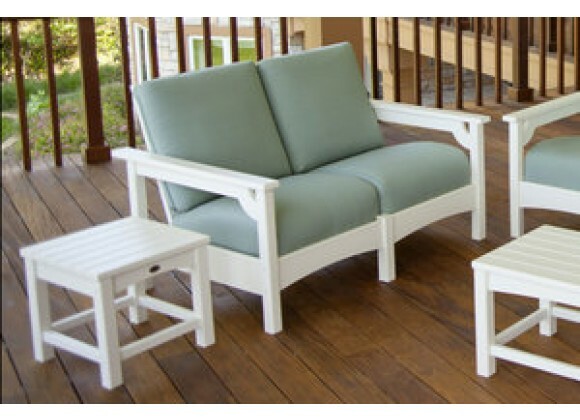 Poly-Wood's commitment to quality allows for many relaxing seasons at the beach, in the yard, or on your patio. Sit back, relax and forget about it. Cozy up with someone special or steal away alone with a good book. Either way, you wont want to leave the comfort of this settee anytime soon. Built with solid POLYWOOD® recycled lumber and accented with contoured cushions that resist weather, salt, sun and mildew, this settee is designed for long-term durability, exceptional good looks and extremely low maintenance.